As a Comchip Technology distributor, NAC offers cost-competitive and short lead time discrete semiconductor solutions including rectifiers, diodes, TVS, ESD surge protectors, transistors and MOSFETS. 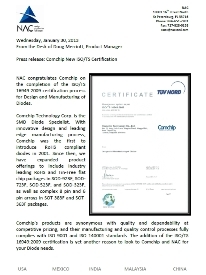 Comchip Technology Corporation is the leader in design and manufacture of SMD Diodes. 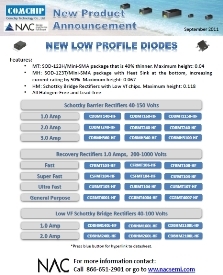 From rectangular small signal switching, low drop-down schottky barrier, zener, rectifiers to custom-made high voltage or low VF rectifiers, Comchip has the right diode for your application.. Comchip's diodes are ideal for personal computers, digital cameras, PDAs, pagers, wireless, networking and portable devices. 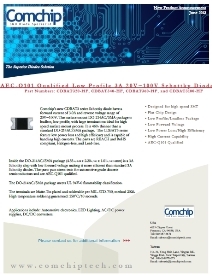 Comchip Releases Automotive Qual'd 3A Shottky SMA Package Diodes.